(Nanowerk Spotlight) There is an increasing interest in flexible solar cells and researchers have been investigating weavable fiber solar cells based on metal wires, glass fibers, or polymer fibers. Unfortunately, the low efficiencies of these fiber-based solar cells greatly limit their promising applications. In order to improve these efficiencies, scientists are exploring various nanomaterials to improve charge separation and transport in these fiber-based photovoltaic devices. 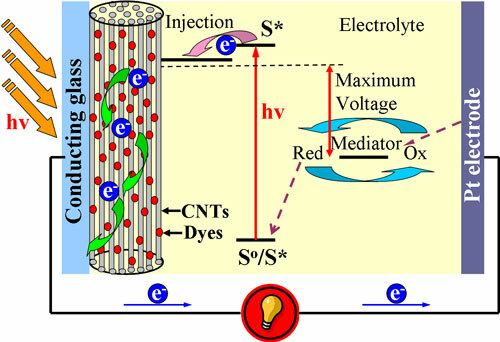 One recent promising result has been demonstrated by a research team in China who have developed a novel solar cell from flexible, light-weight, ultrastrong, and semiconductive carbon nanotube (CNT) fiber. The high alignment of building nanotubes in the fiber allows charges to separate and transport along the fibers efficiently, which provides a fiber solar cell with high performance. Compared with traditional solar cells fabricated from rigid plates or thin-films, the CNT fiber solar cells demonstrate some unique and promising advantages. "For the fibers that we used in our work, the carbon nanotubes show a high degree of alignment with much improved mechanical and electrical properties," Huisheng Peng, a professor in the Laboratory of Advanced Materials & Department of Macromolecular Science at Fudan University in Shanghai, tells Nanowerk." Therefore, these nanotube fibers can greatly enhance the short current density, open voltage, and the energy conversion efficiency of solar cells." In addition, the nanotube fibers are ultra-light and flexible, and their excellent mechanical properties may provide some unique applications unavailable to conventional solar cells, e.g. power regeneration for space aircraft and clothing-integrated photovoltaics. Reporting their findings in the January 18, 2011 online edition of Angewandte Chemie International Edition ("Flexible, Light-Weight, Ultrastrong, and Semiconductive Carbon Nanotube Fibers for a Highly Efficient Solar Cell"), first-authored by Tao Chen, the team fabricated fibers – with tunable uniform diameters ranging from micrometers to millimeters – that could be spun with lengths of tens of meters or even longer. "We found that the nanotube fiber is flexible and will not break after being bent, folded, or even tied many times," says Peng. "High-resolution transmission electron microscopy indicates a multiwalled structure for the building nanotubes with diameter of approximately 8.5 nm in the fiber. Our nanotube fiber demonstrates much higher values in both specific strength and specific stiffness than current engineering fibers. For example, the specific strength of a nanotube fiber is 2.9 times that of T1000, the strongest commercial fiber, and the specific stiffness is 3.9 times that of M70J, the stiffest commercial fiber." Peng points out that the semiconducting properties of CNT fibers may be very important to their optoelectronic applications. "For example" he says, "these nanotube fibers can be used to replace titanium dioxide nanoparticles to fabricate high-performance dye-sensitized solar cells. The electron transport could be much faster along nanotubes – in which the electrons can transport along the nanotubes or hop from one nanotube to another nanotube efficiently – than nanoparticles with abundant grain boundaries, and the charge separation of electrons and holes would be more efficient." So far, no applications of these CNT fibers in solar cells have been really investigated although they are very promising for this field. A previous study by the Chinese team shows that polydiacetylene/ nanotube composite fibers exhibit an intriguing optoelectronic property ("Electrochromatic carbon nanotube/polydiacetylene nanocomposite fibres"). Here now they conduct the first study. Peng notes that, in the past few years, his team has focused on studying the optoelectronic and sensing properties of carbon nanotube fibers and their composite fibers. "Initially, we were mainly interested in their unusual mechanical properties such as very high specific tensile strength" he says. "Then, our interest moved to their electrical and sensing properties, particularly through the introduction of functional polymers. During the second step, we noticed the excellent optoelectronic performances of these fiber materials, so we started the exploration two years ago. At the same time, we also learned about the remaining challenges of fiber solar cells, and believe the nanotube fibers can solve some difficulties in conventional fiber materials." The researchers are currently focusing on the understanding of the basic rules for the high charge separation and transport in the new solar cells, which may be useful to the development of new materials for solar cells. One thing they found is that the electrical and mechanical properties of carbon nanotube fibers strongly depend on the lengths of building nanotubes. Currently, the spinnable nanotubes are typically shorter than 1 mm. So it will be important to further improve the growth of longer nanotubes. Currently, this work mainly gives a paradigm for fabricating organic solar cells using the high-performance nanotube fibers. Peng cautions that there is still a long way to go to further improve the efficiency to become good enough for practical applications, which – due to the light weight and flexibility of the devices – could be easily incorporated into some aerospace or space applications such as foldable solar panels or photovoltaic skins; they could be also easily woven into clothes.